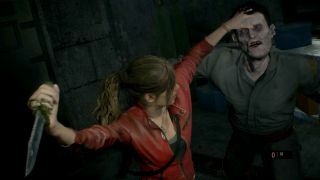 The Resident Evil 2 remake has been out for just under a week at this point and Capcom has collected some fascinating data from players who opted into its tracking feature, including which character's more popular, who has a better kill/death ratio, and how many of Umbrella's monsters have been slain worldwide. Before you click through to the official website or read on here, beware that there are some mild spoilers in either case. No ending details or anything, but if you want to experience the story completely unaware of what strange horrors lurk ahead, you should make like Barry Burton and get the heck outta here. First up, the biggest choice you make in the whole game: Leon or Claire. Not much ambiguity on who's the more popular survivor so far. As of this writing, 79 percent of players choose rookie cop Leon for their first playthrough. I'm not surprised he's the more popular pick; Leon was the only character you could play as in the Resident Evil 2 demo, and he's also the star of Resident Evil 4. Everybody loves Resident Evil 4. But here's the fun part: Claire's substantially deadlier than Leon. When more people pick Leon for their first playthrough, it follows that Claire players would have a better kill/death ratio. Resident Evil 2 encourages you to start an altered version of the other character's campaign after you finish with your first one, so many players are already seasoned zombie slayers by the time they start with Claire. Still, I like the idea that this college kid biker looking for her brother - who pissed off to Europe weeks ago without telling her - is more of a threat than a trained police officer. Speaking of lethality, did you know Resident Evil 2 players have killed enough enemies to almost equal the population of the UK and Japan put together? They still have a ways to go before they slay a whole USA's worth of zombies and bio-organic weapons though - and don't forget our Resident Evil 2 remake tips say you're often better off evading enemies instead of killing them. Capcom will keep updating the Resident Evil 2 remake stats as people play; it should be fun to see how different they look in a month. Until then, I'll keep trying not to scream every time I hear a licker in the hallway.